The Citizens former Manufactured Gas Plant site is divided into two Operable Units to facilitate the investigation and remediation related to former operations. Operable Unit 1 is the main site on which the operations occurred and Operable Unit 2 is the area adjacent to the site as well as an area of the opposite shore across from Operable Unit 1. 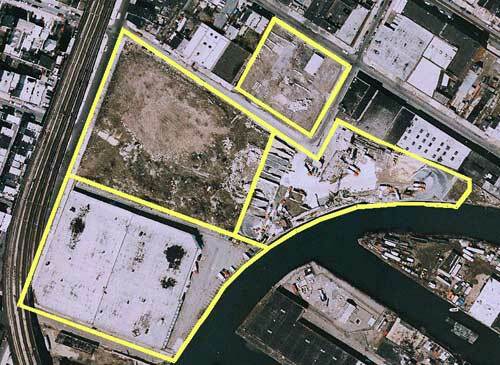 Operable Unit 1 is an 11.5 acre site consisting of four parcels, two owned by the City of New York and two privately owned. This Operable Unit is bounded by Fourth Street, Hoyt Street, Fifth Street, Smith Street, Huntington Street and the Gowanus Canal. Parcel I: Vacant lot that formerly housed the majority of the former MGP. Parcel II: Active concrete plant. Parcel III: Former distribution warehouse, near the end of Huntington Street. Parcel IV: Active truck maintenance facility and commercial truck lot. All of the parcels are secured and gated, with no public access. Groundwater is not used at any of the four parcels and there are no public or private water supply wells within a 3-mile radius of the property. A Manufactured Gas Plant (MGP) operated on the site from approximately the 1860’s through the early 1960’s. 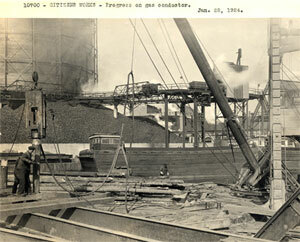 Brooklyn Union Gas, a predecessor company to National Grid, owned the site and operated the MGP from 1895 (when it was purchased from Citizens Gas Company), until decommissioning. Brooklyn Union sold the entire site in the 1960’s to a private company. 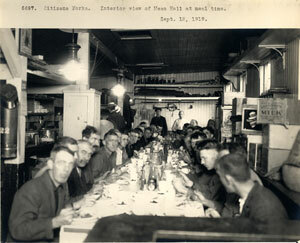 Portions of the site subsequently were sold or leased to other businesses. The City of New York acquired ownership of two parcels in 1975 through tax proceedings, one of which is vacant, the other being the location of the active concrete plant. The other parcels are privately owned commercial uses. The site exhibits the characteristics and contaminants expected of a former MGP site, including the presence of coal tar and dense non-aqueous phase liquid (DNAPL). The contaminants have been found in all four parcels and at several offsite locations, are all below the surface, and have been found to depths of up to 150 feet. Subsurface groundwater is transporting the chemical constituents expectable of a former MGP site -- BTEX and PAHs, including naphthalene. Some groundwater containing these chemical constituents is entering into as well as transiting under the Gowanus Canal. A qualitative assessment of human health exposures to contaminants of concern in soil, groundwater and soil vapor at the site determined that current users of each parcel have a very low potential to come into contact with the contaminants in excess of values determined by the New York State Department of Health to be protective of human health. This reflects that most of the site is covered with pavement, industrial buildings and concrete waste. Groundwater is not used for any purpose in the area near the site. 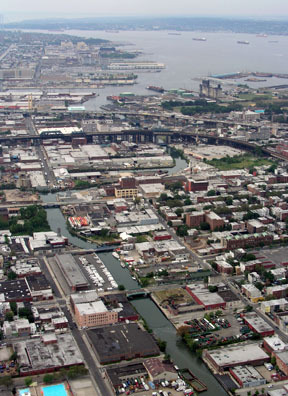 Human exposure to contaminants of concern in the Gowanus Canal associated with the former MGP operations is highly unlikely because of very limited human use given historical impacts to the waterway from other sources and the high concentrations of bacteria associated with the discharge of sewerage from time-to-time into the Canal. EPA’s remedial investigation asserts that fish and other wildlife may be impacted by the chemical constituents associated with the former MGP operations. However, it is important to note that species observed on the site are highly transient and are not likely to be exposed to these constituents for significant portions of their life cycles. Previous studies have also found that aquatic life in the Gowanus Canal is limited by the impacts of 26 sewer discharge points in the Canal, road runoff and other industrial sources.